Gilles Deleuze would call a writing of ‘impersonal singularity’: .. to write is not to recount one’s memories, one’s travels, one’s loves and griefs, one’s dreams and phantasms… Literature takes the opposite path, and exists only by discovering under the apparent people the power of an impersonal which is in no way a generality , but a singularity to the greatest extent: …literature does not begin until a third person is born within us which strips us of the power to say I. The Echo of Your Departures is the first solo exhibition by artist and curator Azadeh Fatehrad at Danielle Arnaud. It explores the history of the feminist movement in Iran, as well as the lives of contemporary women in diasporas, focusing on issues of identity, femininity, emotion, desire, clothing norms and moral values. The exhibition comprises three multi-media installations; National Unity of Women (2016), The Dance of Fabric (2015) and The Echo of Your Departures (2018). Referring to existing images of past events, the works ask how we can recreate history in a contemporary context through a combination of fact and fiction. The first, National Unity of Women (2016), alludes to a series of interviews with Shahin Nawai, one of the leaders of the feminist movement in Iran, who effectively created the National Unity of Women’s Associations during the 1979 uprising. On March 8, 1979, the day after the announcement of the compulsory dress code (hijab) laws, thousands of men and women marched on the streets of Tehran in opposition. 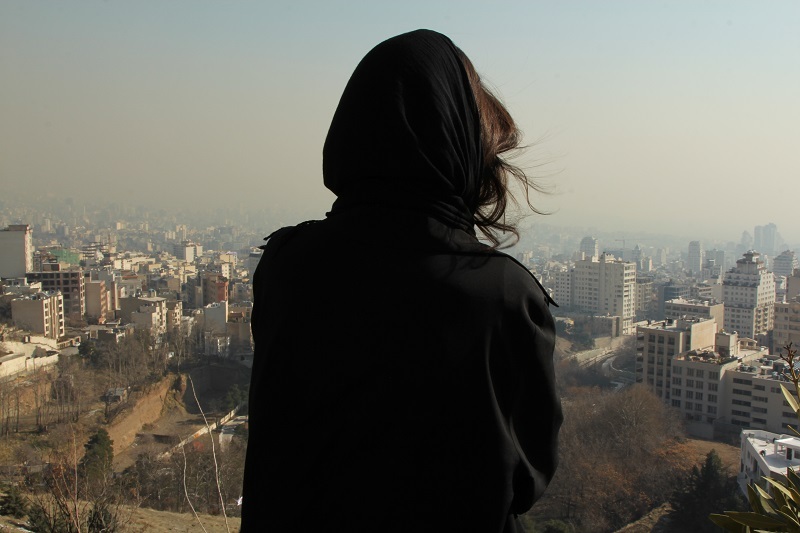 The video reflects on Nawai’s insights into women’s life in Iran, and her activities and viewpoints surrounding the events of March 8, 1979. In the second, The Dance of Fabric (2015), Fatehrad looks at the object of repression (the veil) in the context of Iranian history. She suggests a dimension of beauty and desire to the veil, reflecting on her own life in Iran, as well as creating an imaginary space of self-representation. The last work, The Echo of Your Departures (2018) is a five-channel sound and one-channel video installation. It was inspired by a series of in-depth anthropological interviews with women in diasporas and focuses on themes of migration and transition. Through a collaborative production with composer Matthew Ward, fragments of the interview transcriptions have been combined with imaginary elements of self-reflection to create an ephemeral constellation (of sound and video) through which Fatehrad seeks to represent the notions of uncertainty and in-betweeness in the diasporic experience. The work was produced during a term residency at St John’s College, University of Oxford, with generous support from the staff, and in collaboration with members of St John’s Choir including Sofia Kirwan-Baez, Elizabeth Davis, Laetitia Pilgrim, Margaret Lingas, Anne-Marie Lo, Abby Freeman, Lucy Huntsman, Kathryn Forkey, William Underwood, Cameron Di Leo, Alex Cui, Henry Cole, William Brettle, Thomas Channer, Andrew Wiseman and Philip Burnett. Dr. Azadeh Fatehrad is an artist and curator based in London, working in the context of historical representation. Fatehrad’s research, artistic and curatorial practice are intertwined around a process of gathering information and generating new imagery in response to archival material she discovers. Her practice ranges from still and moving images to fictional stories, short films and artist books which have been exhibited internationally at the Royal Academy of Art (London), Somerset House (London), Weltkulturen Museum (Frankfurt am Main), Index: The Swedish Contemporary Art Foundation (Stockholm), Lychee One Gallery (London) and The Barn Gallery (Oxford), among others. Fatehrad has received her practice-based PhD from the Royal College of Art (2016) and has conducted diverse projects across Europe and the Middle East, including at the Weltkulturen Museum, Frankfurt am Main, the International Institute of Social History (IISH), Amsterdam, AFDI Archiv für Forschung und Dokumentation Iran Berlin eV,Berlin, and the Institute for Iranian Contemporary Historical Studies (IICHS), Tehran. Underpinning Fatehrad’s research is a cross-cultural approach that looks at the artistic, social, aesthetic and political implications of ‘existing images’, and their relation to life today. Fatehrad has curated diverse public programmes such as ‘Sohrab Shahid-Saless: Exiles’ at the Close-Up Film Centre, Goethe-Institut and Institute of Contemporary Arts (ICA), London (2017-18); ‘The Feminist Historiography’ at IASPIS, Stockholm (2016); and ‘Witness 1979’ at the Showroom, London (2015). Her projects have been positively covered by the likes of the New York Times and Financial Times, CNN, Euronews, the Guardian, and the British Journal of Photography, among others. Fatehrad is co-founder of ‘Herstoriographies: The Feminist Media Archive Research Network’ in London and she is on the editorial board of the peer-reviewed Journal for Artistic Research (JAR). Fatehrad is also the recipient of St. John’s College Artist in Residence 2018 at the University of Oxford.